Few would argue that war is preferable to peace, but war is not the ultimate evil. Sometimes war is the only response to evil. Where evil reigns, it is the responsibility of the brave to oppose it. And so it always has been, and always will be, that the balance of good vs. evil is determined upon the Fields of Battle. Fields of Battle is a simple, straightforward, easy-to-use game of mass combat. It easily simulates battles between hundreds and even thousands of combatants, all in a single gaming session. Herein are all the tools you need to decide the outcome of large-scale warfare. 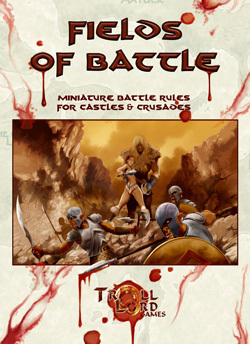 Playable with the TLG�۪s Battle Unit Counters, or any type of miniatures, Fields of Battle is a flexible, easy-to-learn set of rules that allows you to conduct small battles between a few dozen combatants or mass warfare between the armies of kings. Fields of Battle allows you to place your characters on the battlefield. Stand should to shoulder with the combatants or lead them from afar. Fields of Battle blends flawlessly with your table top RPG bringing war to your table like never before. Fields of Battle is fully compatible with most any role-playing game. Its simple Siege Engine mechanic is highly adaptable, allowing you to smoothly integrate the Fields of Battle rules set with any ongoing campaign. Your PCs and their archenemies can even battle it out alongside their clashing forces, their skills and abilities directly impacting the tide of the wars they wage! Whether you play the supplied scenarios or develop your own, Fields of Battle puts the battle in your hands.